Toronto and Region Conservation, (hereinafter referred to as TRCA), is planning to restore the heritage building known as the Small Arms Inspection Building, (hereafter the “Building” or “Structure”), located within the community of Lakeview at 1352 Lakeshore Road East, in the City of Mississauga. The Building location is highlighted in yellow, below and is situated on the lands commonly referred to as the Arsenal Lands. promotion of arts and culture. In 1992, TRCA acquired a 15.7 hectare parcel of land on the eastern border of the Mississauga waterfront referred to as the Arsenal Lands. 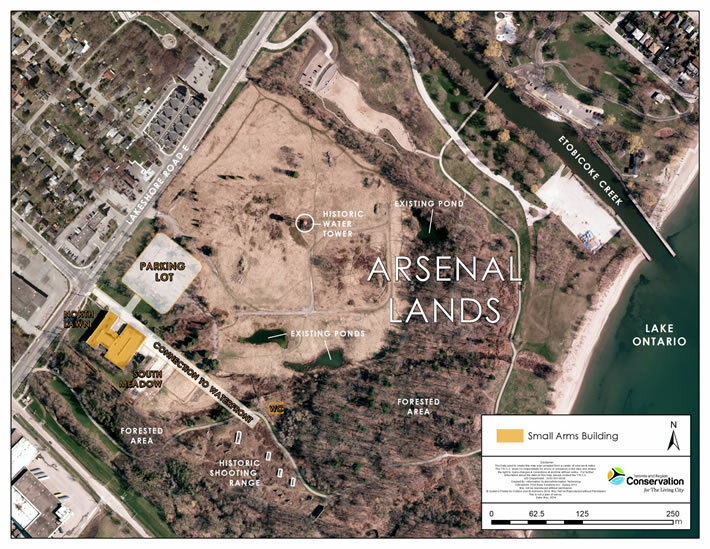 The Arsenal Lands property is bounded to the north by Lakeshore Road East, to the east by Marie Curtis Park West (Toronto), to the south by the Lake Ontario waterfront and to the west by the Waterfront Trail and greenspace owned by the Region of Peel. The Arsenal Lands have played an important role in Canada’s cultural heritage. In 1806, the lands were patented to Colonel Samuel Smith who served with the Queen’s Rangers during the Revolutionary War and later as administrator of the Province. In 1910 the land was acquired for military purposes and shortly after registered by the Department of National Defense as ‘The Toronto Barracks Site’. The lands became part of the Long Branch Rifle Range which was used in training exercises until 1957. Canada’s first aerodome also operated nearby, training pilots that went to England to serve with the Royal Naval Air Services during World War I. And finally, during World War II the Arsenal Lands became the site of a large munitions plant that manufactured rifles and small arms for the Canadian Army, supported by thousands of women who joined the war effort. The Small Arms Building is situated on the north-west corner of the Arsenal Lands property at the foot of Dixie Road. The building, designed in 1939 by Allward and Gouinlock Architects, is an important artifact in Ontario and Canada’s history. Under the threat of demolition in 2008, the City of Mississauga designated the building as being of cultural heritage value or interest under the Ontario Heritage Act in 2009. Since that time, the community has championed a new vision for the building as a future centre for arts, culture, heritage and science. The proposed vision for the building would support the Inspiration Lakeview project, by promoting the transition of the Lakeview community from industrial to a vital mixed use waterfront community. The Small Arms Building and surrounding the Arsenal Lands property have had a rich history, adding to the appeal of the Mississauga waterfront. The rich history of the site and its importance within the Lakeview community and Canadian heritage has inspired a community-driven plan to reinvent the building as a centre for arts, culture, heritage and science. The Small Arms Society – consisting of residents from the Lakeview community – has been the champion for the community-driven plan and will be an important component of the forthcoming redevelopment activities. The Building includes over 43,000 ft2 with three distinct components: a two-storey front former administration wing, a bridging section with one- and two-storey components, and a rear one-storey former inspection plant. The front bridging sections of the building are constructed of a load-bearing clay tile structure with a flat roof and clad in red brick veneer. The rear portion of the building is a one-storey, with high ceilings, a flat-roof with skylights supported by timber post and beam system, double brick masonry and bands of steel-framed windows. The Arsenal Lands are currently zoned “Open Space” (OS2); which allows for a range of active and passive recreational opportunities as prescribed in Section 9.1 – General Provisions for Open Space Zones. The Building is located within the Lakeview community; which is undergoing a Local Area Plan planning study. Under the draft Local Area Plan, there is a vision for the Lakeview community as a whole that includes reconnecting to the waterfront, healthy neighborhoods, social well-being and sustainable development. 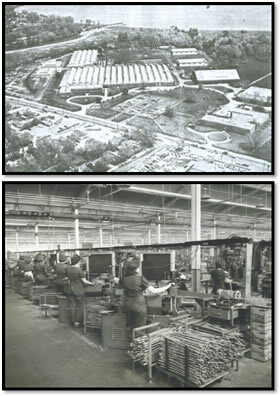 In reference to the subject site, there is consideration for a Special Site on the Arsenal Lands to allow additional uses for the Small Arms Inspection Building (i.e. community facilities, conference centre, commercial schools, restaurants and secondary offices). The Local Area Plan study is ongoing, and scheduled for completion/ratification by City of Mississauga Council in 2015.